Founded in 1939, Ferrotherm Corporation is a long established supplier of gas turbine honeycomb and non-honeycomb seals and shrouds, both rings and segments. Their singular business is manufacturing new and repairing turbine engine parts. Customers include G.E., Pratt and Whitney, Rolls Royce, the U.S. Military and numerous other global customers. The turbine engine parts produced can have complex geometry, and require part tolerances to .001”. Part repeatability and uninterrupted production are of utmost importance to Ferrotherm’s customers. “Repeatability is key and downtime kills” says Robert Francis, Electrical Maintenance Engineer at Ferrotherm. Ferrotherm uses high performance 5 axis grinders to produce the complex geometry found on many of the parts. The machine builder of these grinders use linear glass scales, to assure the precision position feedback to the CNC control system, and to maintain the part repeatability required. The machining process also uses high pressure / high volume coolant, required by the super-abrasive grinding being performed. This high pressure / high volume coolant created maintenance issues with the glass scales used on the grinders. Even air purging the glass scales did not prevent coolant ingress, causing downtime to clean, repair or even replace the glass scales. “Downtime kills”- as Mr. Francis stated - because of the tight delivery schedules required in the turbine engine industry. Mr. Francis became familiar with Newall Spherosyn inductive linear encoders working for a prior employer. Newall’s inductive linear encoders require no air purging, and are IP67 rated (can operate totally submerged.) Properly installed, they are virtually maintenance free. An added bonus of Newall inductive linear encoders is ease of installation – about half the time of a glass scale linear encoder. So the decision was made to try Newall’s SHG-AF linear inductive encoder at the next glass scale failure. Newall’s SHG-AF encoders are absolute (no homing of the machine axes required after power interruption,) and are 100% compatible with the Fanuc CNC control it needed to be interfaced to. The results produced parts within the required accuracy and repeatability tolerances, with no changes or corrections to the machine control system required. After several months of trouble free operation, it was proven out that the Newall inductive linear encoders would insure that downtime and missed delivery schedules, created by scale failure, would be greatly reduced. 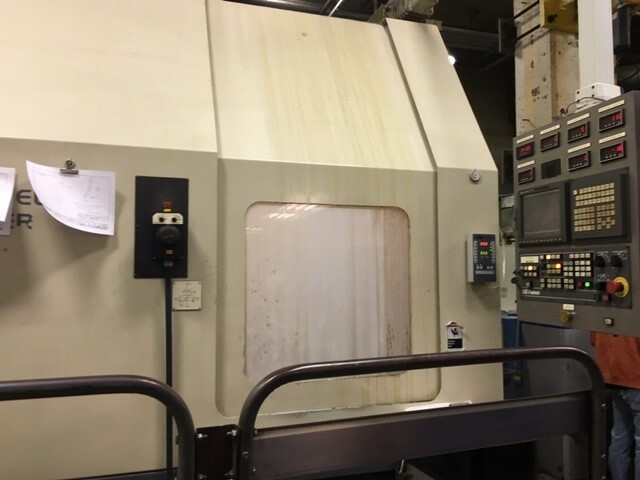 This made the decision easy at Ferrotherm to replace the glass scales with Newall inductive linear encoders, as downtime created by the glass scale failures on the different 5 axis grinding machines, allowed.